Once upon a time there was a girl who was special. \r\nThis is not her story.\r\nUnless you count the part where I killed her. I will start of by saying that UTRAVIOLET is nothing like the synopsis. If you’re going into this book expecting a typical Young Adult book, then this is not for you. 1) It’s Science-Fiction and 2) It’s way out there. UTRAVIOLET starts out after an incident where a girl disintegrates, into thin air, and Alison, the protagonist in the novel, wakes up in the mental ward of the local hospital, foggy from drugs the doctors have given her. She has no idea where she is or why she is there. Her memory eludes her. She’s transported to a nearby mental institution, where she’s initially deemed a danger to herself and others. While there, she meets other patients, all with various disorders and/or neuroses, but remains positive she is sane and shouldn’t be there. Those characters seemed very two dimensional, but it’s possible that, with Alison’s synesthesia, they were meant to be written that way, to provide a contrast between how she sees, hears and tastes (yes, tastes) the world. The concept of UTRAVIOLET is fantastic, but I think it could have been executed a little better. The first two parts of the book focuses on her time in the institution, her experiences with others and her diagnoses. While the sensory descriptions were absolutely wonderful (eg – tasting sounds, hearing stars sing, tasting and seeing colors with numbers and letters), it really doesn’t start to get interesting until she meets a research scientist who is interested in her condition. There is plenty of focus on that, and then wham! You’re left with a staggering plot twist right out of left field in the third portion of the book… that doesn’t flow well with the rest of the book and seems a bit rushed. Overall, it was an enjoyable read and I do recommend it to those who like Science-Fiction and Young Adult. It will definitely surprise you. About The Author: (Per online biography) R.J. Anderson (known to her friends as Rebecca) was born in Uganda, raised in Ontario, went to school in New Jersey, and has spent much of her life dreaming of other worlds entirely. As a child she immersed herself in fairy tales, mythology, and the works of C.S. Lewis, J.R.R. Tolkien and E. Nesbit; later she discovered more contemporary authors like Ursula LeGuin, Patricia A. McKillip and Robin McKinley, and learned to take as much pleasure from their language as the stories they told. 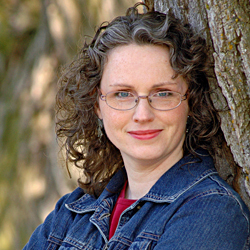 Now married and a mother of three, Rebecca reads to her sons the classic works of fantasy and science fiction that enlivened her own childhood, and tries to bring a similar sense of humor, adventure, and timeless wonder to the novels she writes for children and young adults. She currently lives in the beautiful theatre town of Stratford, Ontario. Lately I have found myself really enjoying science fiction and fantasy stories so I might give this one a shot. I find it frustrating when books have a confusing or rushed ending but if the rest of the book is awesome I can usually overlook that aspect. Great review!